When you are completing undergraduate or graduate studies, or have earned your degree recently, you will likely want to ask a professor or an academic advisor for a recommendation as you begin to apply for jobs. 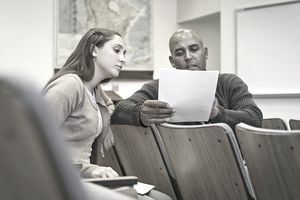 College professors, particularly those who have taught you in multiple classes, can provide powerful recommendations for employers and for graduate school. After all, they have observed you analyze, write, articulate your views, and present to groups. Professors can also attest to the overall caliber and quality of your work. Many professors have an abundance of contacts in the professional world, including ex-students and consulting clients, and they usually have a high degree of credibility with these contacts. Find out who to ask, what information to include in your email requesting a reference, and review sample recommendation requests to professors and academic advisors. People familiar with your academic work and performance are excellent choices to ask for recommendations as you begin your career. You may not have a lot of related work experience in your chosen field, and your professors can speak about the knowledge and skills you have demonstrated that will help you succeed in the industry you are targeting. If possible, request a reference letter from a professor or advisor who knows you well and respects your work and character. That is, don't request a reference from a professor if you were frequently tardy or absent from the class or did not receive a good grade. Ideally, choose someone who you've spoken to outside of the classroom — during office hours, for instance, or at departmental activities. As well, respect people's schedules — if possible, request a reference letter several weeks in advance of when the semester ends or when you'll need it. Even if you already have a positive relationship with your professor, it's important to be tactful when asking for a recommendation. You need to keep in mind that professors teach a great number of students. Although they may have a very positive general impression of you, the most convincing references will require them to give a fair amount of detail to support their positive assertions. You can help them to accomplish this by supplying some of this detail when you make your request. Prepare a summary document that lists each course you took with the professor and references any papers or projects that you successfully completed. Include the grade for individual projects as well as the overall grade for the course. If you have saved a couple of papers that were well received - those with glowing comments in red - supply copies of those documents. Share your resume to give the professor a summary of your extracurricular achievements and your work experience. Describe in writing the types of jobs you're after, and the qualifications that you are focusing on. Including a copy of a cover letter can help with this process. If possible, point to specific classes or projects where you may have showcased some of the core skills you would like the recommendation to emphasize. If you're still in school or living near campus, try to arrange a face-to-face meeting with the professor. Ask if the faculty member would be comfortable endorsing you as a candidate for the types of jobs you're applying to, and then ask if you can stop in during office hours or chat over a cup of coffee to discuss the matter further. Then, follow up with an email or letter to your prospective faculty reference with the attached documents. Make sure you state precisely what you are asking them to do such as to write a general letter of recommendation for your credential file, to write a recommendation for a specific job, or for permission to list them as a reference. Give your faculty members as much advance notice as possible. Towards the end of the semester, they may be burdened by grading papers and exams as well as writing recommendations for many other students. If you don't know the professor or advisor well, make your connection clear in the email. For instance, you can say, "I enjoyed your class on XYZ, which I attended in fall 2017." It can also be helpful to include a summary of related coursework and school activities, along with your resume and cover letter. The more detailed information you provide, the easier it will be for the reference writer to endorse you. Here's a sample letter asking a professor to provide a recommendation for employment. Download the letter of recommendation template (compatible with Google Docs and Word Online) or see below for more examples. I have greatly enjoyed and benefited from the four classes that I took with you over the past three years. I was hoping that you might know me well enough and have a high enough regard for my abilities to write a general recommendation for my credentials file. As you can see from the attached cover letter, I am targeting positions in the publishing industry which will draw upon my writing and editing skills, as well as my organizational ability. I have included a summary sheet to refresh your memory about some of my key papers including my senior thesis. I have also attached my resume which will bring you up to date about some of my accomplishments outside the classroom. Please let me know if you are comfortable endorsing my candidacy for jobs in the publishing industry. I would be happy to answer any questions and provide further information which will help you to write your recommendation. Can we meet during your office hours to discuss this further? Thanks so much for all you have done for me and for taking the time to review this request. Once your professor writes the reference, make sure to send a thank you note to your reference, acknowledging the favor. You can either send a handwritten note or an email. Keep your faculty members up to date with your job search as it progresses. Make sure to let them know if you an employer seems to be ready to conduct a reference check. You should also provide the professor with a job description and copy of your cover letter so they will be prepared should they receive a call.